I remember hearing about Douglas Rushkoff's and Gordon Sudzuka's A.D.D. well before it came out last year, but I only just got a chance to read it tonight. I don't recall exactly what I'd heard -- probably just the solicitation -- but I do remember thinking it sounded really interesting. I don't think I've seen any reviews or much in the way of PR, so I figured I'd throw my two cents in now, even if it's a bit late. 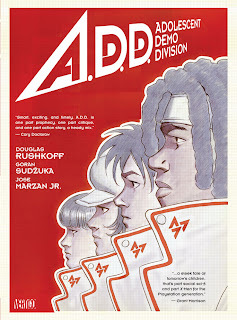 A.D.D. stands for Adolescent Demo Division. It's basically a group of teenagers that are employed by Nextgen to beta test and promote their games. These kids are the top players in the world and are treated like heroes in the real world, no doubt in part because of Nextgen's marketing of them through reality shows and action figures and the like. However, these gamers are largely isolated from the rest of the world, living exclusively on the Nextgen campus since before they can remember. Their entire world is experienced second-hand through a media landscape consisting mostly of games. As the kids age, however, they start seeing "through" some of the media they're bombarded with. Effectively subliminal messaging to reinforce the existing hierarchical power structures in society. The adults who monitor them consider this a kind of immunity, and are actually using the kids as lab rats while they work to devise ways to counteract that resistance. But as a precautionary measure, once one of the teens progresses far enough to see through the patina of the games, they're elevated to the "next level" and graduate to the real world, one from which not-so-coincidentally no one ever hears from them again. The story primarily follows Lionel, who currently ranks third among the group. Just as he's starting to catch glimpses of that subliminal messaging. He sets himself on a mission to find out just what's going on. Rushkoff sets up here a different kind of dystopia than you usually see. Although probably thanks in part to Sudzuka's art, it doesn't feel nearly as dark and downtrodden as you might find in typical cyberpunk tale. Also, we see the world largely as it's experienced within Nextgen, who are effectively the ruling class of this world. There's only the briefest of glimpses beyond the Nextgen walls. which adds up to making the book feel like it's got a lighter and less ominous tone overall. The type of thing that might appeal to a wider audience than if the book were very dark. There is a LOT going on in this book. Rushkoff's entry in Wikipedia says about him: "Viewing everything except for intention as media, he frequently explores the themes of how to make media interactive, how to help people (especially children) effectively analyze and question the media they consume, as well as how to cultivate intention and agency. He has theorized on such media as religion, culture, politics and money." All of that is in A.D.D. to vary degrees. Which makes it somewhat difficult to parse out a good take-away. I suspect Rushkoff would prefer readers just think and reflect on some of the ideas, rather than be able to regurgitate a single, simplistic theme, but it does make writing a review more difficult! I like that the story is generally written smartly. Rushkoff does not talk down to the readers at any point, and doesn't flatly explain the set-ups or character backgrounds or anything. He assumes readers are smart enough to pick out enough contextual clues, and leaves them enough to follow along. That said, there were a few instances where it wasn't entirely clear what was going on, even after a few reads. It's one of those where you can't tell if it wasn't written particularly well (Rushkoff has only written for a sequential art format twice before) or if the fault lies more with Sudzuka's art itself. It happened just enough to pull me out of the story enough times to really prevent me from really getting into it. Which was disappointing. I really wanted to like it, and I thought Rushkoff has some interesting things to say here. But it wasn't quite smooth enough, especially considering how much he's trying to say. I think I'll pass on trying to track down Rushkoff's other comics, but I am intrigued enough to see if I can track down some of his non-fiction prose. A.D.D. retails for $24.99 in hardcover.